Leo T. Tyrrell, 69, of East Hartford, husband of Virginia (Farles) Tyrrell, died Monday (May 15. 1995) at Hartford Hospital. He was born In Boonville, N.Y. He was retired from Consolidated Consolidated Cigar Co. He was a Navy veteran of World War II and also a veteran of the Korean Conflict. 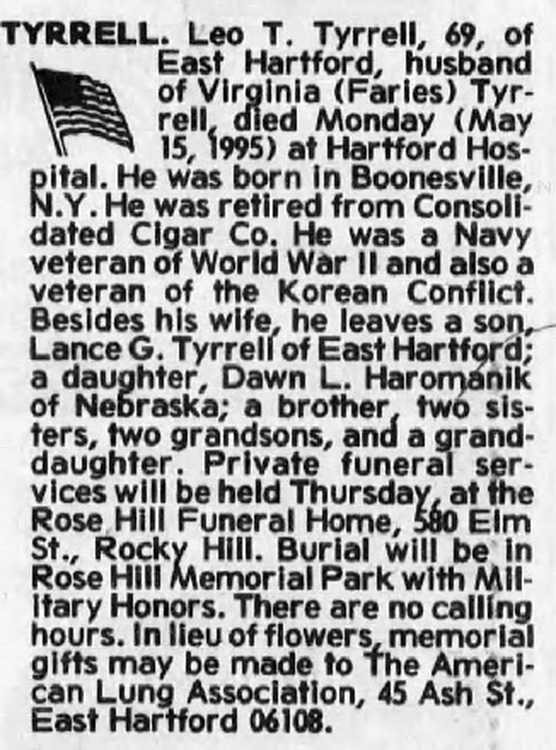 Besides his wife, he leaves a son, Lance G. Tyrrell of East Hartford; a daughter. Dawn L. Haromanlk of Nebraska; a brother, two sisters, sisters, two grandsons, and a granddaughter. Private funeral services services will be held Thursday, at the Rose Hill Funeral Home, 580 Elm St., Rocky Hill. Burial will be In Rose Hill Memorial Park with Military Military Honors. There are no calling hours. In lieu of flowers, memorial gifts may be made to The American Lung Association, 45 Ash St., East Hartford 06108. [Hartford Courant, Hartford, T, 17 May 1995, Wednesday, Other Editions, Page 52] Leo enlisted in the U.S. Navy on 13 December 1943 and served aboard the destroyers USS Kendrick [DD612] and USS Edison [DD-439] and was discharged on 2 May 1946 as a Seaman 1st Class. He later joined the Army and was a member of the 508th ARCT until discharged on 17 August 1954.